The Roses beaches after L’Almadrava are small practically deserted coves. ...but it is a stunning drive, and we think the seclusion is well worth it. 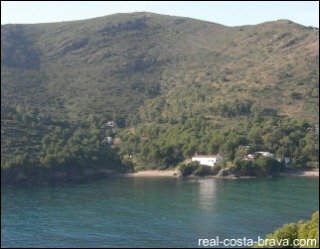 Cala Murtra, 5.5km from Roses, is the first cove you come to. Although, given their seclusion, you can get away with taking all your clothes off on most of the coves on the Cap de Creus headland. Cala Murta is the only official nudest beach of Roses. Cala Murta is a 120 m long coarse sand cove, accessible by boat or on foot along dirt track (about a 20 minute walk). A bit further on, 6km from Roses, is Cala Rostella. 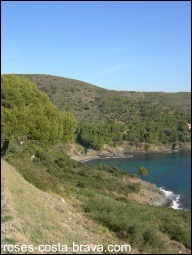 Cala Rostella is a 100 m long coarse sand cove, accessible by boat or on foot along dirt track (about a 20 minute walk). 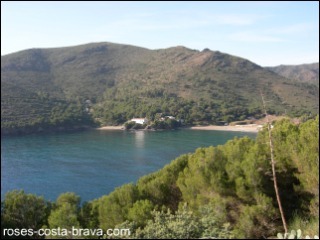 Then you arrive at Cala Calis (7 km from Roses). This small sand beach (50 m long) is actually part of Cala Montjoi. It’s separated from the main beach by El Bulli...frequently voted the best restaurant in the world! We haven’t visited El Bulli yet, so cannot personally recommend it, but I don’t suppose we need to when it has already been voted as the number one restaurant in the world. 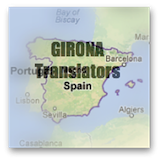 Hopefully we’ll go there one day though and will be sure to tell you all about it (news update on El Bulli). Cala Montjoi is the next beach you reach along the Cap de Creus headland. The beach of Cala Montjoi is a coarse sand 270 m long beach, backed by a small collection of houses. El Bulli being sat on its shore. Even if you can’t quite stretch the wallet to afford El Bulli, and you don’t fancy scuba diving...Cala Montjoi is a lovely quiet beach on which to while away an afternoon. Cala Calitjas is 110 m long and is made of grey sand, accessible by boat or on foot along a short dirt track. Then almost immediately you come across Cala Pelosa, just before the Cap de Norfeu headland. This cove is a 90 m long coarse sand beach. Cala Pelosa is quite popular as there is a small car park and a restaurant/bar just behind the beach. You will then pass the promontory of Cap de Norfeu (one of our favourite walks is on Cap de Norfeu...it’s a beautiful place). On the other side of Cap de Norfeu is Cala El Canadell - a 60 m long beach of pebbles and quite large rocks dotted about in the surf (these make a perfect place to sit and dip your feet after a walk around Cap de Norfeu). 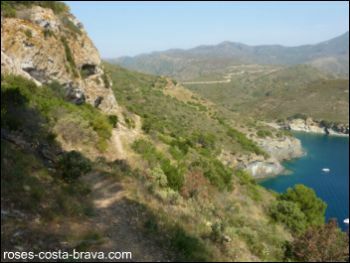 El Canadell is 10 kms from Roses, accessible by boat or on foot along a dirt track (about a 10 minute walk). 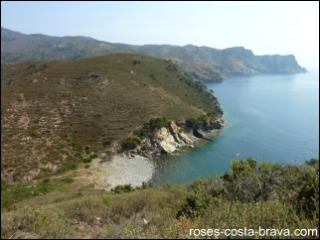 The last Roses cove is Cala Joncols, 12 km from Roses. Cala Joncols is a 190 m long pebble beach, backed by a small collection of houses and a hotel. You can park at Cala Joncols, making it easily accessible. There is a dive centre located here, to take advantage of the great scuba diving round the Cap de Creus headland. There is no webcam for the coves of Roses, but there are webcams for the main beaches of Roses. So if you want to check out the weather or what the other beaches look like, take a look at the beach webcam. To get to the coves you need to either take Carretera a Montjoi out of Roses, or Carrer de Gauguin out of L’Almadrava (which joins Carretera a Montjoi). Carretera a Montjoi becomes Carrer de la Roca at Montjoi and keeps snaking round the headland to all the other coves.